Since electric scooters came to Fort Lauderdale, many people have found themselves trying them out in what is generally thought to be an environmentally-friendly way to get around. Scooter companies work very similar to ride share companies in that a rider can be on his or her way by simply downloading an application, uploading payment, and following the instructions to unlock a scooter. Unfortunately, this simplicity and environmental benefit comes with a different price. Local 10 News recently reported that a Fort Lauderdale teen is in critical condition after being hit by a car while riding an electric scooter. Fort Lauderdale Fire Rescue authorities told reporters that since the beginning of December, they have been averaging one call per day regarding scooter-related incidents. 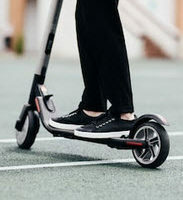 And though no national data on scooter injuries exists yet according to the Washington Post, emergency room physicians around the country have reported experiencing a spike in people seeking treatment after severe accidents after scooters are launched in their cities. What Are the Risks of Riding Scooters? Low visibility. Despite being much smaller than cars, scooter riders have to share the road with them. Unfortunately, the small size of scooters means that car drivers are less likely to be able to see a scooter rider. Road hazards. Hazards that would have a minimal impact on a driver inside a car, such as limbs from trees, potholes, and debris in the road, all pose significant risks to any scooter rider and can cause a crash as the rider attempts to avoid the hazard. Risky behavior. Despite it being a bad idea with regard to the operation of any kind of vehicle, people ride scooters after ingesting drugs and alcohol. Similarly, multiple riders on the same scooter and riders who choose not to wear a helmet are also engaging in risky behavior that increased the chance of being injured. Inexperienced riders. Because anyone can download an application to start a scooter, inexperienced drivers who are below the driving age can hop on a scooter and hit the road despite not having a license or the experience to abide by driving laws. Minimal barrier between the rider and the road. Unlike in a car, a scooter offers very little barrier, and therefore very little built-in safety measures, between the road and other drivers. There are also no seat belts and no air bags to cushion the rider when a crash occurs. What Do I Do if I am Injured in a Scooter Accident? Get the medical help you need before doing anything else. Then contact an experienced personal injury attorney who can help ensure that you hold the responsible parties accountable. Have You Been Injured in a Scooter Accident? Contact Us Today. If you or someone you know has been injured in a scooter accident, the Fort Lauderdale personal injury attorneys at The Pendas Law Firm can help. If someone else was at fault, you should hold them accountable and ensure that you are compensated for your medical bills, lost wages, as well as your pain and suffering. Begin by contacting us today to schedule a free consultation. The Pendas Law Firm also represents clients in the Orlando, Jacksonville, Miami, Fort Myers, Tampa, Bradenton and Daytona areas.